Think your chronic snoring is just an annoying habit? Think again! Aside from disrupting the sleep of everyone around you, it could also be an indicator of a much more serious sleep breathing disorder known as obstructive sleep apnea (OSA). The condition affects about 20 million American adults -- are you one of them? If so, Meriden Dental Group can help you get the treatment you need. Obstructive sleep apnea occurs as a result of the partial or complete blockage of the airway during sleep. The lower jaw and tongue can relax so much that it becomes difficult for air to flow through the throat to the lungs, and snoring often results from this blockage. Desperate for oxygen, your body sends an emergency signal to wake up. 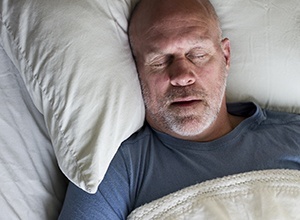 Sufferers of OSA can have their sleep interrupted hundreds of times per night. Because some symptoms of OSA are similar to other conditions -- like depression or anxiety -- the disorder may be misdiagnosed or remain undiagnosed for years. Finding a proper diagnosis for OSA could not be more important. Left untreated, the condition has been linked to serious heart conditions, depression, and even premature death. If any of these symptoms sound familiar, you should visit your family doctor as soon as you can. He or she will likely refer you to a sleep clinic for a sleep test. If the results reveal OSA, we can provide you sleep apnea therapy right here at Meriden Dental Group. One common method for treating sleep apnea is with continuous positive airway pressure (CPAP) therapy. It’s a small machine hooked up to a nasal mask, and it works by pushing air into the throat to keep the airway open during sleep. Unfortunately, many patients find the treatment to be more disruptive than the original symptoms of sleep apnea. These “CPAP intolerant” sufferers may find relief in a removable oral appliance. Meriden Dental Group provides sleep apnea therapy using a small mouthpiece that repositions the jaw during sleep. By preventing the collapse of the tongue and lower jaw, the airway remains open throughout the night, and you’ll enjoy a full night of sleep once again. If you or a loved one has received a diagnosis for sleep apnea, it’s time to seek out the relief you deserve with a removable oral appliance. Contact Meriden Dental Group to discuss sleep apnea therapy today.